SOUTHAMPTON, Bermuda — The crisis that Black males face has to be viewed and confronted from a global and international perspective, according to scholars from across the world who are gathering this week in Bermuda for the fifth annual International Colloquium on Black Males in Education. They argue that creating a space to exchange ideas and perspectives concerning the global dynamics of Black males in the educational pipeline is essential if long-term progress is to be made on a global scale. Here on this British territory just 600 or so miles from North Carolina that boasts a population of about 62,000, the issues that confront young Black male are visibly daunting. In recent years, Bermuda has been plagued by staggering high school dropout rates of Black males, as policy makers have been struggling to recruit and retain Black males to Bermuda College, the nation’s only institution of higher education. Greene says that of the 800 students enrolled at BC, only about 237 are Black males, while the number of Black males incarcerated has risen to about 200. Douglass, the author of a new book Border Crossing Brothas: Black Males Navigating Race, Place, & Complex Space draws on the experiences and journeys of 12 Black Bermudian males who share their educational experiences in places such as the school house, in barbershops, local sports clubs, the Church and the neighborhood. Douglass who grew up in Bermuda, says that many only think of the nation for its “beautiful water and its pink sands,” and the years of economic prosperity, he says, ignoring the escalating socioeconomic divisions and the rising rate of gun violence that have decimated whole communities. For example, when Douglass was a youngster in the 1990s, Bermuda had several high schools. Now, the country is down to only two. “You have to cross borders to get access to opportunity,” he says of the youngsters who will ultimately have to transfer to another country in order to earn a four-year undergraduate degree, as he did when he enrolled in Oakwood University in Huntsville, Alabama to earn his Bachelor of Arts degree and then continued to the University of Alabama in Huntsville for his Master of Arts in English and finally to the University of North Carolina at Greensboro where he earned his Ph.D. in Educational Studies/Curriculum & Teaching. Zerriko Wilson, 18, a first-year student at BC has aspirations of continuing his education in England once he graduates next year with his Associates degree. Raised by a single-mother, Wilson says that grit and determination has helped him to achieve. Bermudian experts say that they are committed to investing new resources to helping Black boys across the island become prosperous. Before the colloquium officially kicked off, Dr. LaVar J. Charleston, the assistant director and research associate for Wisconsin’s Equity and Inclusion Laboratory at the University of Wisconsin- Madison organized a Graduate School Academy for student participants from Bermuda and U.S. who are participating in the week-long colloquium. The Academy provided students with practical tips on applying to graduate school and how to excel once students are admitted. 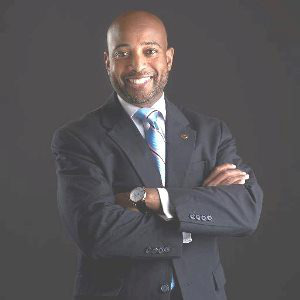 “When you enter, you may feel that you are a fraud and you don’t belong but that’s far from the truth,” says Dr. Robert A. Bennett, III, of the Todd Anthony Bell National Resource Center on the African American Male at The Ohio State University.